At least 53 civilians have been killed in Russian air strikes in the east Syrian village of Al-Shafah, a monitoring group says. The UK-based Syrian Observatory for Human Rights (SOHR) said 21 of those reportedly killed on Sunday morning were children. The village is in Deir al-Zour, one of the last provinces where Islamic State still holds territory. Initially SOHR said 34 had been killed in strikes on residential buildings. But the monitoring group's head told the AFP news agency it now believed the figure was higher. "The toll increased after removing the debris in a long day of rescue operation," Rami Abdel Rahman said. How much success has Russia had in Syria? 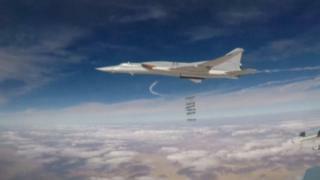 Earlier Russia confirmed that six long-range bombers had carried out air strikes in the area, but said they had hit militants and their strongholds. Russia is a key ally of Syrian President Bashar al-Assad in the country's long-running civil war. UN-backed peace talks are expected to resume in Geneva next week, but several previous rounds of negotiations have failed. Separately on Sunday, there were reports of 23 people killed in a rebel-held enclave on the outskirts of Damascus. SOHR said several towns in Eastern Ghouta had been hit by air strikes and artillery fire. Neither of the reports have been independently verified. The monitoring group says 120 people have been killed since the Syrian army began its offensive there nearly two weeks ago. After years of siege, conditions for Eastern Ghouta's 400,000 residents are dire, with reports of people dying of starvation. In a report last week, the UN said food was so scarce some residents had been reduced to eating animal fodder and even garbage. Eastern Ghouta is one of several "de-escalation" zones in Syria announced by Russia, Iran and Turkey earlier this year.